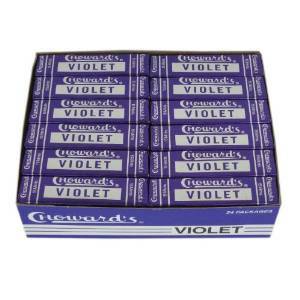 A box of violet deliciousness; just ordered from Amazon. Before I remembered to look for the prompt for Stream of Consciousness Saturday, I was flailing; struggling to find a “V” word. I already have words for X and Z and a few options swirling about for W and Y. 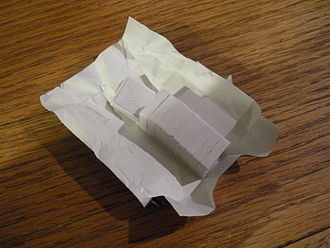 But, V, V was killing me, until exactly this moment as I remember that I had had a thought about a V word at the very beginning of this A to Z thing– and that’s why there’s a picture of Violets candy here. I’ll end with what’s what with Violets. Your Friday prompt for Stream of Consciousness Saturday is: vary/very. Use one, use ’em both, add stuff to ’em, your choice. Have a blast! I also sat down here to finish off a blog post I’m ghostwriting but – SQUIRREL!!! – what can I say, I’m like a two-year old in a candy store where all the candy is free, there’s a petting zoo, and a wall of screens with cartoons on. I’m easily distracted. I’ll get to that blog post at some point today. So I’m sitting here loading in CDs – many of which I had thought were on my iPod already. I still have – and use – a 120 Gig iPod. New old school, right? George still makes fun of me for wondering when we were first dating why the hell anyone would want one. When this think eventually dies, I’m going to be crushed. I changed my mind – though I don’t think I ever told her she was right (even if, sigh, she was). Anyone driving through Alabama, Georgia, or Tennessee has probably seen at least one of these. I have seen Rock City. It’s very cool in a very cheesy way. VERY cheesy. The view is incredible though. the Civil War. 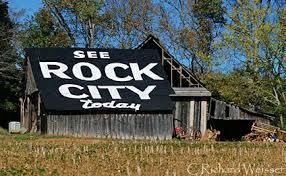 Also, See Rock City.) where all you can catch is two Jesus stations and a country station. There’s nothing like a southern preacher’s cadence calling down fire and brimstone on a sinner’s soul to get you through another hour of driving at 2 in the morning. Meddle – Pink Floyd. “One of these days I’m going to cut you into little pieces.” WTF is THAT about?!?!? The Next Big Thing – Vince Gill. One of the purist voices in all of music. Beautiful singer. Pepper’s Lonely Hearts Club Band – The Beatles. It’s the Beatles. Though, I do think, like Vincent Vega in Pulp Fiction, I’m an Elvis man. There’s a cut scene where Mia Wallace talks about her theory that you can like both Elvis and The Beatles, but you always like one a little more than the other. I’ve gotta go with Elvis in all his glorious, somewhat wasted talent, white-spangled jumpsuit glory. Streets of Fire Soundtrack – various. I LOVE this movie and the soundtrack. “I can dream about you,” “One bad stud” and I can’t believe I was missing this on my iPod. It is a rock and roll musical. I just looked and I have no clue who any of the singers are, but I love every song on it. Rick Moranis is awesome in this movie. It’s over acted and over the top, but fun. Every Breath You Take – The Police. The most beautiful stalker song ever. The Baddest of George Thorogood and the Destroyers – always thought that was a great band name, The Destroyers. “Bad to the Bone” and, of course, one of the best drinking songs of all time “One Bourbon, One Scotch, One Beer.” Other good drinking songs: “I like beer” by Tom T Hall, “Tiny Bubbles,” “I Got Loaded,” and “Two More Bottles of Wine” by Delbert McClinton. Heavy Metal Soundtrack – Various. Like Streets of Fire, great, great soundtrack. And I love the movie a lot too. Johnny Cash, Columbia Country Classics, Volume 1 – I think I have more Johnny Cash albums than anything else. “Great” is spread around a lot these days, but his music is truly great. From “Hey Porter” on this album to “Among the Stars” an album that came out last year; I never get tired of listening to Cash. Why you never hear him on “country” radio . . . a tiny bit baffling. So, varied is my music selection – and then there’s the jazz, blues, Civil War music CDs, medieval music, musicals, and Japanese Drummers that is in this stack here to load. The “shuffle” is the best thing ever when you just can’t decide what to listen to – and on my shuffle, you get a very varied experience. Just a quick word on Violets. My Meme loved this candy and passed that on to me. Uncle Doug brought them from New Hampshire to her when he lived there in the 80s (I think) and she was hooked on them. Growing up, we were at Meme and Pawpan’s a lot and she’d share them out when she had them. Oh, wow, it must be 11 or 12 years ago now, but I hadn’t seen them in over a decade when I saw a box of them in one of the Sutler’s tents at a battle reenactment. I bought the entire box of 24 rolls. It was great being able to share them with her when I went back down later that summer because she hadn’t seen them in a while either. There are a few spots around that you can find them now – one candy store on the Inner Harbor most recently. Every time I see them, I think of her, at least for a moment, and wish she were still here. Casey enjoys a Violet now and then. I hope when she’s older, she’ll have one and think of me for a moment or two. Meddle is a terrific album. San Tropez is a favorite and who can complain about a song (Seamus) where they actually appear to play a dog as a musical instrument? Nice work knocking off SoCS and A-to-Z. Thanks, sir. My order of love for Pink Floyd albums shuffles, but Obscured by Clouds is always at the top. Something about the album just always chills me out. One day, I’ve gotta try the Dark Side of the Moon/Wizard I’d Oz thing too. And I am stoked to have Meddle back in rotation. What was I thinking? I like “Set the Controls for the Heart of the Sun” from Saucer full of secrets. I was a very early fan of Floyd. Back when they were carried on “alternative rock” station in Pgh. I haven’t listened to either Saucer Full of Secrets or Atom Hearted Mother in a good long while. I like a little King Crimson (always enjoyed Court of the Crimson Kind) and maybe some Procol Harum now and then, but prog-rock is one of the few genres of music I’ve never been able to get into much.